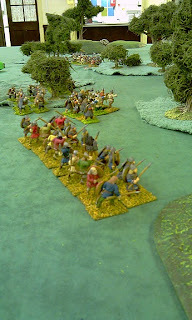 A band of Viking raiders on their way to sack some Saxon settlement are intercepted by the local Fyrd (Militia). The terrain, being somewhat wooded, meant that the forces started largely out of sight of one another, and that conventional shield wall tactics would be difficult to perform. The Vikings formed in 3 groups, light sword and axe raiders on the left, the archers and most of the hirdmen in the centre and on the right. 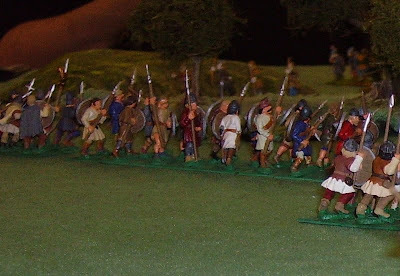 The Fyrd were a mixed bag of spearmen, with a few peasant (ceorl) archers on their right. 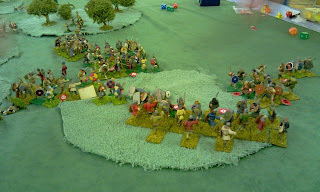 Both sides moved forward to engage, except the saxon left which chose to await the mass of the Viking centre and right. Faced with damaging shooting from the Saxon archers, the light Viking raiders on the left disobeyed orders and ploughed straight forward, scattered the bowmen and drove straight into the Saxon shield wall-- with predictable disastrous results. 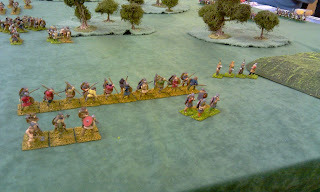 On the Viking right, the Hird initially held back while their few archers shot at the Saxons. The Viking centre, seeing the defeat on their left launched a desperate charge to try to break the Saxons before being outflanked by their victorious right wing. Despite the belated help from the Viking right, they failed to make sufficient headway, and with their centre breaking up under fierce Saxon counterattacks the Viking command signalled the retreat. Time to find a softer target…..!